A Call for better supervision of serious criminals let out of prison early was issued last night following the revelation that five had committed murder in recent years. Official figures show five offenders were convicted of murder in the last five years. One was jailed in 2001, two in 2003 and two in 2005. The number of homicides by prisoners out on supervision were revealed in a parliamentary question by SNP deputy justice spokesman Stewart Stevenson. Mr Stevenson, MSP for Banff and Buchan, said one murder was one to many. "Although these figures are comparatively small there is a suggestion they may be rising," he said. "The important thing is to ensure that our supervision of people on licence and let out of jail early is up to the mark. We don't have enough criminal justice social workers and must be doing more to recruit them, put them in place and ensure that all supervision orders of whatever character are properly resourced." The number of murders committed by offenders on licence was revealed by Justice Minister Cathy Jamieson who said a new system of individual assessment is being put in place. All the offenders in question were released subject to the provisions of the Prisoners and Criminal Proceedings (Scotland) Act 1993, and had been sentenced to four years or more. "Offenders sentenced to terms of four years or more are eligible to be released on parole licence at the direction of the Parole Board after serving one half of their sentence and will be released on licence at the two-thirds stage of sentence," she said. "The Custodial Sentences and Weapons (Scotland) Bill, currently before parliament, proposes to end the current system of unconditional early release and replace it with a system based on an individual assessment of risk. There will be no change to the current law covering the treatment of life sentence prisoners." North-east campaigners have won their battle to save maternity services in three Aberdeenshire towns. NHS Grampian will confirm on Monday that it has taken the advice of Health Minister Andy Kerr and drawn up plans to create birthing units at Fraserburgh, Banff and Aboyne. The announcement will mean low-risk mums-to-be will continue to be allowed to deliver their babies locally. And the health board's decision was welcomed last night as "great news" by an MSP who played a key role in the fight to persuade NHS Grampian to abandon its controversial closures programme. The SNP's Stewart Stevenson (Banff and Buchan) took part in a protest march and rally in the Broch and arranged a meeting between members of the town's Maternity Action Group (MAG) and Mr Kerr. 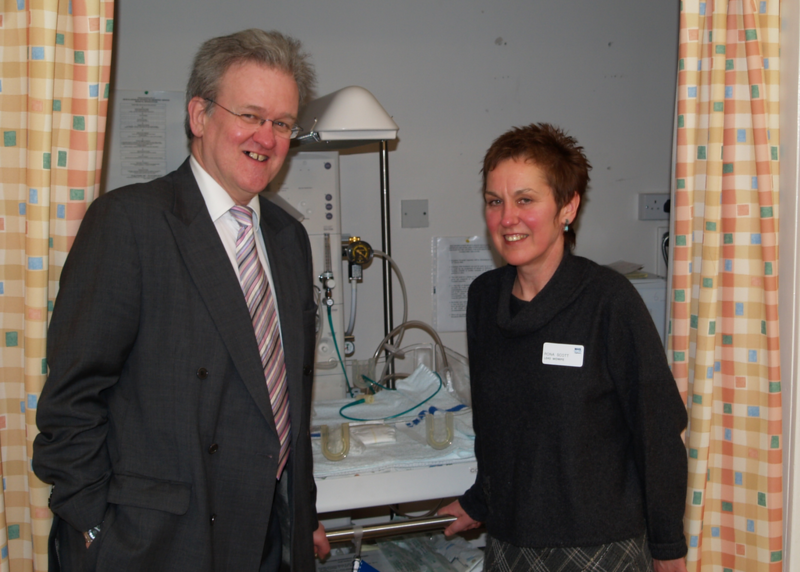 Earlier this month he went on a fact-finding mission to Skye to see the birthing unit at Broadford in action, and had urged health chiefs to follow NHS Highland's lead. Mr Stevenson and other north-east MSPs met with NHS Grampian officials yesterday. He said afterwards: "I fully expect that the mothers-to-be who previously elected to give birth in their communities rather than trek into Aberdeen will continue to be able to do so. "This will be great news for these mums and their children, and great news for Fraserburgh, Banff and Aboyne, where people have fought so hard to retain this service. "I congratulate all the mums - and dads - who have driven this change of heart through.The redesigned maternity services now proposed will allow all the mums who previously would have given birth in their communities to do so in future. "I've been delighted to be able to join campaigners to promote this outcome and to speak in parliamentary committees and debates and arrange meetings with government ministers and officials. But at the end of the day, it has been the mums who have made the case and have won the fight." MAG member Valerie Ritchie said: "This is wonderful news. "All the hard work that went into the campaign has been well worth it. "It just shows that if you want something you have to fight for it." Save Aboyne Maternity campaigner Jenna Storey said: "We are jubilant that births will remain in the community and that NHS Grampian has listened to the health minister. "The signs have always been good and I have always been optimistic as women have been voting with their feet. "The number of births at the unit last year was up to 82. We hope if it is the outcome that we want, it will only be the beginning of the hard work, with service users working together with midwives at the unit." West Aberdeenshire and Kincardine MSP Mike Rumbles said he was "as certain as he could be" that the announcement would be good news for Aboyne and other north-east maternity units. He said: "I am impressed with the meeting I had with NHS Grampian chiefs and I am almost certain that they will accept the minister's recommendation. "That is the ability for low-risk mothers to have planned births at Aboyne Maternity Unit, a unit which is distinct, safe and secure for mums giving birth. I am as positive as I can be that this is what is going to happen and this means everything to the campaigners and to Aboyne." An NHS Grampian spokesman confirmed last night that the board's chairman, Jim Royan, will meet with Mr Kerr on Monday. The health minister refused to endorse proposals to close the maternity units at Fraserburgh, Banff and Aboyne and gave the health board until the end of this month to produce a report on whether or not there is scope for providing birth units for low-risk mothers "along the lines of ones already in place in other parts of rural Scotland". Midwife-led birthing units have a delivery room and recovery room and the one at Broadford saw a trebling of births from eight in 2003 to 24 in 2005. 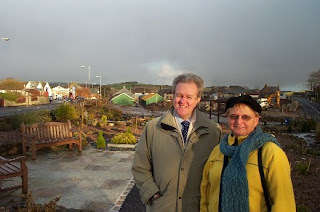 Banff & Buchan MSP Stewart Stevenson and Buchan South councillor Norma Thomson have praised Maud Village Trust for their efforts to rejuvenate the village by regenerating the former Aberdeen & Northern Marts site. The regeneration, which is currently underway, will see a range of facilities in place once completed including supported accommodation, community resources and health care, as well as creating employment. "I was delighted to see the progress being made with the regeneration of the old mart site during my visit. "The Village Trust have already created a very attractive garden area with public seating and the work which is happening onsite now will help to put the heart back into Maud. "The Maud Village Trust is to be congratulated for their commitment to the project, which is of vital importance for the future of the village." "It's taken a lot of hard work on the part of a lot of volunteers to get where they are now, but the village can now see the structure of the regeneration taking place. "I am pleased that the project is moving forward and the facilities which will be in place once completed will be a tremendous asset to Maud." Banff & Buchan MSP Stewart Stevenson has stressed that much should be done to protect our town centres in the light of two reports on the effects of out of town supermarkets and shopping centres. “It is no co-incidence that The Federation of Small Businesses (FSB) Scotland has published an independent report on the effect of out-of-town supermarkets on high streets and independent retailers across Scotland on the same day as the publication of the Competition Commission’s interim report into the grocery market. “The FSB study supports the broad view that large supermarket developments impact adversely on the retail structure of the traditional town centre. “This report has shown a decrease in the number of convenience retailers operating in town centres, an increase in the number of vacant units and corresponding floorspace. The research shows that up to 80% of shoppers now do most of their food shopping in new out-of-town supermarkets, and as a result, as many as 78% shop less in the town centre. “The Competition Commission has expressed its concern that supermarkets, can get into such a strong position, so that no other retailer can compete effectively, as the number of stores operated by the ‘big four’ has doubled since 2000. “In addition, the Competition Commission (CC) report reflects the huge concerns within the Scottish farming industry over the increasing power of supermarkets. This has already been seen through the lack of a fair price given to dairy farmers for their milk. “I am pleased to hear that the CC’s enquiry team will now be looking further into the impact of supermarket behaviour across all farming sectors. It is vital that our farmers are protected and that they are not held to ransom by the big supermarkets. Local SNP MSP Stewart Stevenson has condemned reports that the UK Government has said it may dip into National Lottery funds to make up for a shortfall in the final budget for the London Olympics in 2012. "It is becoming clear that the costs of the London Olympics are quickly spiralling out of control and they now threaten the amount of funding which will be available for good causes and local organisations here in the North-east. "We have already had the resignation of Jack Lemley, the Chairman of the Olympic Delivery Authority, amid this impending disaster blaming political interference and escalating costs. "We have also learned that the estimated costs of the Olympics may have more than doubled from £2.4 billion to £5 billion. This is after several ministerial assurances that the Olympics would be delivered on budget. "It is utterly unfair that further raids are put on the lottery and those good causes the lottery supports are sacrificed for the London games. It is vital that the UK Government can guarantee that charities and sports clubs will not be affected by Whitehall mismanagement." Banff & Buchan MSP Stewart Stevenson has highlighted the importance of Eating Disorders Awareness Week, which takes place 4th – 10th February. “I applaud this campaign as it is of vital importance that the views of the young people who are so much at risk from these serious, life threatening conditions are listened to. It must also be noted that it is not solely a young person’s disease. Anyone can develop an eating disorder regardless of age, race, gender or background. Nevertheless, young women are the most vulnerable, particularly between the ages of 15-25 years. “Research suggests that a person's genetic make up may make them more likely to develop an eating disorder. As well as biological reasons, a key person - a parent or relative, for instance - may adversely influence other family members through his or her attitudes to food. “In situations where there are high academic expectations or social pressures, a person may focus on food and eating as a way of coping with these stresses. Some people also find they are affected by an urge to harm themselves or abuse alcohol or drugs. Eating, or not eating, is used to help block out painful feelings. Without the right help and treatment, eating problems may continue throughout life. *UPDATE at 7th May 2013 - as www.edauk.com no longer appears to be active, readers may find http://eating-disorders.org.uk/ useful. COUNCIL tax payers are stumping up £3million extra to pay the wages of more than 200 police officers in Scotland. Local authorities are spending the cash each year on 220 additional officers -bolstering the forces paid for by the Executive. Rank and file police and opposition politicians yesterday said the number of police paid for by councils proves there is a shortage of officers on the beat. And they warn that soon only communities who can afford to pay will get the police officers they need. The SNP's Stewart Stevenson, who is on Holyrood's justice committee, said: "Hard working families are paying their taxes and then have to pay more rent or additional charges, to get basic police cover. It is not on." Joe Grant, General Secretary of the Police Federation, said: "For us, it is disturbing that the police appear to have regularised a double funding system. The obvious risk from that is it will only be those who can afford to pay who get the police officers they need. "We need to be sure being safe in your home doesn't rely on the size of your chequebook." Strathclyde has the most council-paid officers with 101, Lothian and Borders has 81 and Tayside has 20. Some are only partly funded by the local council or housing association. Last night, a spokeswoman for justice minister Cathy Jamieson said: "Thanks to investment by this Executive, we now have a record 16,000-plus officers in Scotland -some 1500 more than in 1999. "If other local agencies decide it is in the interest of local priorities to bolster these record resources with additional support, we will gladly stand shoulder-to-shoulder with them in their fight against crime." Scottish National Party MPs and MSPs for the North-east today (Friday) attended a meeting with NFU Scotland President John Kinnaird and local farmers to discuss concerns about proposed changes to Nitrate Vulnerable Zone (NVZ) regulations and new Integrated Pollution Prevention Control (IPPC) rules which will affect pig and poultry farmers. Today’s meeting took place at the Thainstone Centre, near Inverurie. Representing the SNP were Party Leader Alex Salmond MP, Banff & Buchan MSP Stewart Stevenson, Maureen Watt, MSP for the North-east Region, and Aberdeen North’s Brian Adam. SNP representatives had previously raised the issue of IPPC charges with Rural Development Minister Ross Finnie when he visited Banffshire recently at the request of local MSP Stewart Stevenson. Mr Stevenson in particular has been a vocal critic of environment agency SEPA’s stance on the charges being levied on farmers in Scotland for IPPC registration, which are several hundred pounds more than in England and Wales. “This was a very useful meeting for all who attended and underlines the importance of these issues to the agriculture industry in the North-east. “On the issue of NVZs, we have yet to see the evidence that justifies further restrictions on the spreading of manure and fertiliser. Indeed, the indications are that the measures the industry has been taking to date have had the desired effect. Yet the Government is proposing further ‘closed periods’ and a reduction in the Nitrate loading limit. “We need common-sense on this issue and we need to see the science on which the Government is basing its claim as the evidence just doesn’t support the Government’s claims. “On the issue of IPPC regulations, SEPA must be held to account on these. We heard evidence today of farmers who are outwith the current scope of IPPC regulations but have decided not to expand their business in case the charging threshold is lowered. “Clearly, as well as making those affected think seriously about their future in the industry, these regulations and associated costs are also acting as a disincentive to further expansion within the industry, which has to be a concern. “The consensus around the table is that SEPA is completely out of control in the charges it levies on farmers and in the application of the various regulations. “SEPA’s staff numbers have ballooned in recent years and I am now utterly convinced that a large part of what they do is now aimed at bringing in enough cash to meet their ever-inflating salary bill. Banff & Buchan MSP Stewart Stevenson has made his submission to NHS Grampian on maternity service provision in Banff and Fraserburgh. The move follows Mr Stevenson’s visit last week to Broadford to tour the birthing unit there which has seen a trebling of local deliveries since it was established in 2003. Health Minister Andy Kerr refused to endorse NHS Grampian’s plans to axe the units at Fraserburgh and Banff and ordered that the Health Board look at providing ‘birth units’ in the towns along the lines of the successful units in place elsewhere in Scotland. Mr Stevenson had earlier in the year flagged up the success of the units run by NHS Highland, in particular the one at Broadford which had seen a trebling in the number of expectant mothers giving birth in their local area. “I refer to the ongoing review relating to maternity service provision and should like to add my views to your consultation. “During the last week, I visited the Dr MacKinnon Memorial Hospital at Broadford, Isle of Skye to tour the Birth Unit and met with Lead Midwife for Skye & Lochalsh Rona Scott for discussion. “Firstly, I would make it clear at the outset that it is not for non-health professionals such as myself, having identified a requirement for, and a desire by the local community to have, certain health services in their own locality, to say how these should be delivered on the ground. The important point here is that it is clear to me that in both Fraserburgh and Banff that there is in fact a local demand for maternity/birth services and indeed a requirement for such services and it is now incumbent on NHS Grampian to respond positively to that demand. “By way of background, maternity services at Broadford were re-organised in 2003 to address various factors, many of which are relevant to the situation here, such as workforce planning issues, low local delivery rates, issues of skills maintenance and competency, etc. “It is worth noting that since re-organisation, the delivery rate at Broadford has risen from 8 in 2003 to 24 in 2005. This has fallen back slightly in 2006 but I was advised that the number of ‘bookings’ already taken for 2007 would indicate that this upward trend will continue. “A large part of the ethos of this midwife-led service is to “demedicalise” as far as possible the experience for each expectant mother. That is to say that through the use of named midwives being assigned particular expectant mothers, a relationship is built up over the period of the pregnancy. As Lead Midwife Scott put it to me, pregnancy is a normal part of life and the service aims to keep it “normal” as far as possible with appropriate medical intervention as may be required – as in any other area of life. “This strategy has, according to Lead Midwife Scott, led to there having to be no inductions performed, (and often, inductions can lead to a cascade of other medical interventions being required) and little requirement for expectant mothers to be administered diamorphine. “In reaching its recommendations, NHS Grampian has placed great emphasis on the claim that at the current level of births in the units in my constituent, retention of skills is an issue. At Broadford, which we know has experienced 24 births during 2005 (a low number in relation to Fraserburgh for example), I found that no such concerns exist. “Lead Midwife Scott advised that the 2003 re-organisation has led to an increase in both confidence and competence of the midwives along with improved leadership and support. Indeed, it seemed to me from my discussions that skills maintenance was being enthusiastically addressed on an ongoing basis by the midwives carrying out their jobs in geographical areas other than those for which they were responsible from time to time, giving them access to other situations they may not necessarily come across too regularly in Skye & Lochalsh and allowing them interaction with other members of NHS Highland staff. “This seems to me to be a common-sense and highly practical approach to addressing this important issue and the midwives at Broadford have shown quite clearly that that can be quite easily overcome and that a valuable – and valued – local service can be maintained. “As you will know, at my briefing meeting with NHS Grampian last week, it was confirmed to me that the criteria for expectant mothers using a birthing unit would be exactly the same as that for those who currently give birth in their own locality. Given that this is the case, I therefore see no reason why expectant mothers who are ‘low risk’ should not enjoy the benefits of a birthing unit and be able to give birth in their own community without the need for a long and sometimes stressful journey into Aberdeen. “NHS Grampian has also expressed concern regarding expectant mothers travelling in a counter-direction to consultant-led services. The experience of Broadford clearly shows that there is no good reason why expectant mothers who wish to give birth in their own locality, and who have been assessed as ‘low-risk’ should not be able to do so. In addition, both Fraserburgh and Banff have ambulance depots, and in the case of Fraserburgh a 24-hour ambulance depot which was upgraded to full-time status several years ago following my lobbying of the Scottish Ambulance Service, and are both somewhat nearer to acute services than Broadford. “In conclusion, I believe that the case for local delivery of health services as espoused by campaigners and the Scottish Executive has been proven. At a time when there is huge pressure on the NHS to deliver more for less cost to more patients it would be a retrograde step to centralise maternity services in the City – which are already at or over capacity - when a working and highly successful template for birth units for low risk expectant mothers exists in neighbouring health board areas which can spread the load across the region. “I enclose for your information two documents which were given to me by Lead Midwife Scott on my visit which I am sure will be of value to you in your deliberations. Banff & Buchan MSP Stewart Stevenson has supported an event organised by Save Cash and Reduce Fuel (SCARF) in the Scottish Parliament. SCARF, a company established to promote sustainable use of energy and tackle fuel poverty, yesterday (Wednesday) held a presentation of prizes to winners of their 2007 Energy Efficiency Calendar Competition. The competition attracts around 4000 entries from primary school pupils, who are asked to submit illustrations which raise issues in relation to energy efficiency in the home. Mr. Stevenson congratulated local prize winner, Lauren Stables from Fetterangus Primary School, Mintlaw and met with representatives of SCARF to discuss the serious issue of energy efficiency and the challenges of fuel poverty faced locally in the North-east. 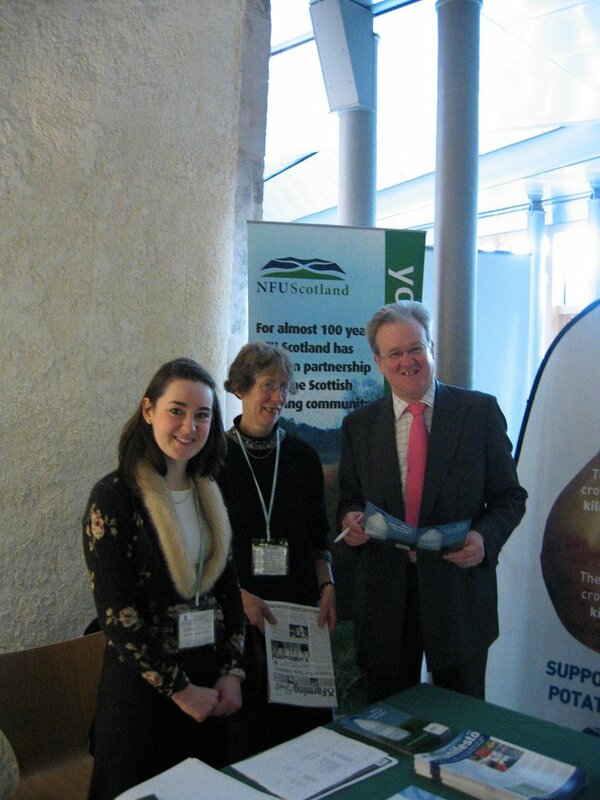 "I was delighted to see SCARF bringing its vital message of domestic energy efficiency to the Scottish Parliament. With 328,000 fuel poor households in Scotland today, fuel poverty is an issue of growing concern, particularly in the North-east and practical solutions to the issue of affordable heat are desperately needed. 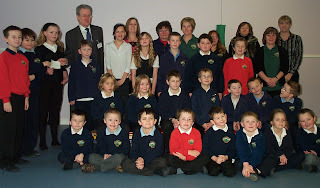 "The presentation was an extremely positive event binging young and old together to celebrate the hard work put into the calendar by the winning pupils, but also to push the issue of energy efficiency in the home to the fore. "The Energy Efficiency Calendar has a very wide circulation and I was extremely pleased to see that one of my constituents had succeeded in having her illustrations published in this year’s edition. I extended my sincere congratulations to the winner from Mintlaw who has represented her area in an outstanding fashion and should be very proud. "I took the opportunity to discuss the issue of affordable energy with SCARF representatives and raise with them the various problems relating to fuel poverty faced by my constituents in Banff & Buchan"
Consultation on Voting Rights of Convicted Prisoners Detained Within the UK. I refer to the above consultation and I am pleased to offer this response in my capacity as Shadow Deputy Minister for Justice in the Scottish Parliament. In considering the issues set out in the consultation document and those raised by the ECtHR judgement in the case of Hirst v United Kingdom, I am of the view that current legislation withdrawing the voting rights of convicted, detained prisoners is correct and enjoys the support of the overwhelming majority of the public. I suspect it would be a very hard ‘sell’ indeed convincing the public that law breakers should have a say in the election of the law makers. If we start from the premise that the removal of liberty is only considered for those who have breached the basic laws of our society then there can be no question of such individuals continuing to enjoy the most basic right in our democracy, the right to the franchise. As a Parliamentarian who receives correspondence from prison inmates around the country and not just from the gaol located within my own constituency, I would observe that any proposal to give prisoners the vote at their previously registered address will encounter particular difficulties. For example, I recall one example of a prisoner who, in the course of my attempting to find out which was his ‘home’ constituency in order to refer him to his own MSP, revealed that owing to family circumstances and the passage of time, he no longer had any such address or constituency to call home. Such an example, whilst perhaps extreme, could be overcome by allowing prisoners to vote in their ‘gaol constituency’. However, this would also be impractical as those constituencies which have a prison population could find the result of their election unduly influenced by the entry into the equation of several hundred prison inmates with the right to vote. I do not know whether this is still the case, but I draw attention to the case of the City of Durham Constituency which had, I believe, during the 2001 Parliament, and may well still have, three prisons located within its boundaries. Clearly, if prison inmates enjoyed the right to vote then Members with large prison populations may well find themselves the subject of attempted and concerted influence from those detained at Her Majesty’s pleasure. As stated previously, I believe that the current law in this area is correct. However, if it is to be the case that the Government decides to move from its present position, then I would only support the right to vote being extended to those convicted detailed prisoners with sentences not exceeding three months. I trust that the foregoing is helpful and should be grateful if you would acknowledge safe receipt. Local SNP MSP Stewart Stevenson has welcomed steps taken by Aberdeenshire Council to introduce a ban on street drinking in Fraserburgh. Mr Stevenson has been a long-time campaigner for Aberdeenshire Council to introduce a by-law banning street drinking. The MSP, who went on late-night patrol with Grampian Police in Fraserburgh on a Saturday night/Sunday morning shift, says that the introduction of a ban would lead to less vandalism as police would be able to confiscate bottles – many of which can end up being used as missiles against shop windows. “I do not believe there is a huge problem locally with street drinking but there is a problem nevertheless and action needs to be taken to address it. “In Fraserburgh, the problem here as I learned from going on foot patrol with the police is the menace of alcohol bottles being taken out of licensed premises and being used as missiles against shop windows. “Speaking to the bobbies on the beat, they left me in no doubt that a ban on bringing alcohol into public places would go a long way to addressing the issue. I am therefore delighted that the council have taken the first steps towards the introduction of such a ban. Politicians and drug workers have leapt to the defence of a north-east community branded Scotland's heroin capital. The spotlight has again been turned on Fraserburgh following the suspected heroin overdose death of a former skipper. Jackie Green died in a flat close to his home in the town's Kirk Brae, just a year after telling how he had beaten his addiction thanks to a rehab programme in South Africa paid for by his family. His death is believed to be one of three drug-related fatalities in the Broch which police have been asked to investigate since December 23. But someone who has worked closely with local addicts has hit out at claims in some sections of the media that Fraserburgh has the worst drugs problem in Scotland. Janice Jess, who co-ordinated the volunteer Grampian Addiction Problems Service, said: "We should knock on the head right away the notion that Fraserburgh is Scotland's heroin capital. "Yes, it has its drugs problems, but so does every community in the country." Banff and Buchan MSP Stewart Stevenson agreed. "It is a fact that Fraserburgh has its drugs problems, but it is also a fact there are other communities in Scotland which have far worse problems," he said. "What we are also very thankful for is that we don't have the same level of crime or violence associated with the drugs scene as many other places do. "One of the encouraging signs we're seeing is that people are looking at the havoc drugs have wreaked on previous generations and moving away from them. Young people are looking at brothers, sisters, uncles, parents and not going into drug abuse in the same way." SNP leader Alex Salmond has called for more emphasis to be put on providing solutions to the drugs problem and helping addicts recover. The Banff and Buchan MP said: "It's not fair and it's not right to describe the Broch as the country's drugs capital. "There are serious problems but the same can be said of communities all over Scotland. To single Fraserburgh out is very misleading." Mr Green, 47, was found dead six years after a heroin overdose claimed the life of his ex-fisherman brother, Stephen. In December 2005, Mr Green told the Press and Journal how he had blown £1million on drugs and parties. He bought the 85ft trawler Karizma for £260,000 in 1992 and was making more than £50,000 a year as a skipper. But in November 1997 while fishing off Norway the vessel started taking in water and Mr Green and his crew of five had to scramble into a liferaft. He hired out his fishing quota for cod and haddock for £180,000, and a year later sold his quota of 500 boxes a trip outright with his fishing licence for £1.2million. The former skipper planned to take a couple of years off work before deciding what to do next, but developed a £500-a-day heroin habit. His family rallied together and raised the money to send him to the Hope House rehab clinic in South Africa. He was found dead at his home last Tuesday. Banff & Buchan MSP Stewart Stevenson visited King Edward School, near Banff, on Monday 15 January to present the school with a cheque for £400 to support the school’s sporting activities. Mr Stevenson received the funds for visiting the former Soviet state of Georgia at the request of the Westminster Foundation for Democracy (WFD) and wanted to use the money in his constituency. The WFD exists to help foster the democratic process in countries where there previously were no elections and to encourage civic participation. “The idea behind the Westminster Foundation for Democracy is to arrange visits from Parliamentarians to the ‘emerging democracies’ of Eastern Europe and Africa to advise and assist Parliamentarians there in the democratic process. “For doing so, WFD sent me a payment of £400. I didn’t seek any payment for doing so and wanted to put this sum to good use in assisting local children in their sporting activities. “King Edward School was suggested to me as a worthy recipient. The parents and children have voted on what they would like to do with the funds, which is very appropriate given the source of the money. Fears have been raised by politicians and campaigners about the high level of drug use in the Aberdeenshire fishing port town of Fraserburgh. The concerns follow the death of former trawler captain Jackie Green, from a suspected drug overdose. The 47-year-old become addicted to heroin after he lost his trawler and sold his fishing quota. Campaigners claim that access to drug services and after-care programmes in the area is insufficient. Mr Green was believed to have become addicted to heroin after earning more than £1m from the sale of his fishing vessel. His family raised money to send him to the acclaimed Hope House addiction clinic in South Africa allowing him to kick his habit. However after returning to the Aberdeenshire town, friends claim he fell back into drug use. Alex Salmond, SNP leader and MP for Banff and Buchan, said that after-care services to support former addicts after they returned to the community following rehabilitation were badly needed. "Although rehab facilities have improved in recent years, there still a real difficulty in that people come out of rehabilitation and basically the after-care, the support mechanisms after they come out, is not there to prevent them falling back into the same lifestyle as took them into rehabilitation in the first place," he added. According to recent figures, police believe up to one in five adults in Fraserburgh may have drug problems. Mr Salmond conceded that though the situation seemed to have improved in the last couple of years, problems in the town were still "very serious". However Janice Jess, co-ordinator of Grampian Addiction Problems Service (Gaps), said that Fraserburgh should not be labelled as Scotland's "drug capital". "Every community in Scotland from Caithness to the Borders has got drug problems in them," she added. "What we [Fraserburgh] haven't got is a consistent and decent drug policy in order to handle those problems. "It's totally missing its targets all the time so instead of having a resolution or even reduction to the problem what we're having right now is a growth in the problem." Better services should be made available as a matter of priority, according to Ms Jess. Stewart Stevenson, MSP for Banff and Buchan, claimed that the situation was slowly improving. "One of the encouraging signs I think - particularly in Fraserburgh and repeated I believe elsewhere - is that we're seeing the next generation looking at brothers, sisters, uncles, parents and not going into drug abuse in the same way," he added. "The lesson is beginning to be learned but the problem remains quite significant." Member of the Scottish Parliament for Banff & Buchan, Stewart Stevenson, has backed a campaign by the National Farmers Union (NFU) Scotland, to support Scottish Dairy Farmers in their efforts to receive a fair price for their milk from supermarkets. NFU Scotland has brought the campaign to the Scottish Parliament, where they have been highlighting the seriousness of this issue to MSPs. Mr Stevenson met with NFU officials to discuss the challenges faced locally in the North-east as a result of the unfair pricing of milk by supermarkets. “I was delighted to see NFU Scotland had brought their campaign for fairer milk prices to the Scottish Parliament. This is an issue which is of the utmost importance to Scottish dairy farmers and I welcome the NFU’s move to bring pressure upon supermarkets to act on this matter. “Agriculture is one of the most essential industries in the rural parts of my constituency, and I am very concerned at the figures which the NFU produced to demonstrate the effect unfair pricing of milk has had on dairy farmers. Over the last six years, one in four Scottish dairy farmers have gone out of business due to the present situation, and this scenario will only degenerate if supermarkets do not alter their present policies. “While policing at the St Fergus Gas Terminal will now be more visible, I understand that there is no increased threat to security there. “In an uncertain world caused by the Prime Minister’s Middle Eastern adventures, it is a sad fact of life that we have to ensure that such installations are protected. Banff & Buchan MSP Stewart Stevenson has hailed his fact-finding visit to NHS Highland’s birthing unit at Broadford on the Isle of Skye as “extremely useful”. The SNP MSP met with Skye & Lochalsh Lead Midwife Rona Scott at the Dr MacKinnon Memorial Hospital yesterday (Tuesday) for discussions and a tour of the facility. Mt Stevenson had earlier in the year flagged up the success of the units run by NHS Highland, in particular the one at Broadford which had seen a trebling in the number of expectant mothers giving birth in their local area. “This was an extremely useful meeting indeed and I am very grateful to Lead Midwife Rona Scott for giving so freely of her time to answer my questions. “The set-up at Broadford is an excellent example of the type of facility which could work very easily in places such as Banff and Fraserburgh. NHS Grampian have already confirmed to me in discussions last week that the criteria for expectant mothers using a birthing unit would be exactly the same as that for those who currently give birth in their own locality. “I therefore see no reason why expectant mothers who are ‘low risk’ should not enjoy the benefits of a birthing unit and be able to give birth in their own community without the need for a long and sometimes stressful journey into Aberdeen. “I was impressed by the dedication of the midwives at Broadford and their commitment to ongoing development of their skills through a series of initiatives. One of NHS Grampian’s key arguments against local units is that 50 births per annum is insufficient to maintain and develop midwifery skills. The midwives at Broadford have shown quite clearly that that can be quite easily overcome and that a valuable – and valued – local service can be maintained. Health bosses in Grampian have been urged to look to NHS Highland in their review of maternity services ordered by Health Minister Andy Kerr. Banff and Buchan MSP Stewart Stevenson is convinced the type of birthing centres operated in the Highlands and Islands can provide the model for a network of baby units in the north-east. He visited the Dr Mackinnon Memorial Hospital at Broadford, Skye, yesterday as part of the campaign to allow expectant mothers at Fraserburgh, Banff and Aboyne to continue delivering locally.Health chiefs have backed plans to close the maternity wards in the hospitals in all three Aberdeenshire towns. Mr Kerr has refused to endorse the controversial proposals however, and sent them back to the drawing board.NHS Grampian has until the end of this month to produce a report on whether or not there is scope for providing birth units for low-risk mothers "along the lines of ones already in place in other parts of rural Scotland". Health board bosses will meet maternity campaigners and other community representatives today to discuss potential ways forward. Mr Stevenson will send a report on his Skye visit to NHS Grampian before the end of this week. The SNP MSP said last night: "The key message is that, as mothers have become more confident with the midwife-led service, the number of births at the Skye unit has increased. "They feel as if they are being treated as individuals rather than just patients. "What has happened in Broadford is a very useful example. "First, it confirms that, given the choice, expectant mothers will choose to have their babies locally rather than travel. "Second, it shows that a revamped service on Skye has led to a trebling of births in the unit, from eight in 2003 to 24 in 2005. "Third, and more importantly in terms of the campaign, it shows that a unit can be viable at a fairly low level. "At Fraserburgh and Banff we are talking about annual figures in excess of 50. If the unit in Broadford can be run successfully and safely at that level then there is no reason why that system cannot be deployed in the north-east." Following a public consultation, which was criticised by campaigners as not being wide-ranging enough, Aberdeenshire Community Health Partnership, which is responsible for organising and providing NHS services in the area, recommended the closure of the Fraserburgh, Aboyne and Banff maternity units. Its proposals, which involve keeping open the delivery ward at Peterhead Hospital but setting it targets, were backed by the NHS Grampian board.Health chiefs insist they are only responding to the falling birth rate and the growing population of elderly people. Banff & Buchan MSP Stewart Stevenson has welcomed news that Aberdeenshire Council will receive an extra £272,000 this year to fund adaptations to the homes of older people and others with disabilities to help them to continue to live independently. The funding is part of a package from Communities Scotland, announced by Communities and Sports Minister Stewart Maxwell, which provides an extra £15 million for the Private Sector Housing Grant (PSHG) bringing the total to £82 million in 2007/2008. The additional funding will also help local authorities prepare to implement the Housing (Scotland) Act 2006, which gives them powers to create new services, such as specialist advice, available to homeowners who need to repair and improve their homes. "These extra funds will allow Aberdeenshire Council to raise the standard of living for some of the most vulnerable residents in our area. "This will help older and disabled people in Banff & Buchan adapt their homes to support them to live independently, and will enable the Council to fund new approaches to helping owners fund repairs and improvements." “I therefore see no reason why expectant mothers who are ‘low risk’ should not enjoy the benefits of a birthing unit and be able to give birth in their own ommunity without the need for a long and sometimes stressful journey into Aberdeen. BUCHAN Dial-a-Community Bus has received funding from the Scottish Executive's Rural Community Transport Initiative which will enable them to continue their work through to 2011. The project has received a further three years funding from April 2008 to run a variety of different community transport projects including door to door shopping services, transport to medical facilities, group use services as well as evening transport for young people. Dial-a-Community Bus (DACB) manager Mrs Rachel Milne was overjoyed at the news; admittng: "Our present funding runs out in spring 2008 and the news from the Rural Community Transport Initiative that they were prepared to continue to fund the project was fantastic - a wonderful Christmas present, and a real testament to the need for our services. "Our customers have grown to rely on DACB over the past six years and now we can continue to offer an affordable transport alternative to those people who cannot use public transport." But Rachel added a cautionary note warning: "We have been given 59% of our running costs which is phenomenal but it still means that we have to continue to fundraise to make up the shortfall. We will still be selling raffle tickets, holding coffee mornings and bingo nights so I hope the local community will remain as supportive as they have always been." Dial-a-Community Bus currently has three minibuses and a volunteer car service provide transport for those clients who may not be able to access public transport due to infirmity, disability, social or rural isolation. They have grown from a one day a week Maud based shopping service to a major community transport provider in Aberdeenshire. Dial-a-Community Bus has also works in partnership with Aberdeenshire Council's Public Transport Unit to deliver the A2B Dial-a-Bus services in the Peterhead and Fraserburgh area as part of the Council's A2B Demand Responsive Transport scheme. They also manage the Shopmobility project from the portacabin in Maiden Street Car park Peterhead, in collaboration with Aberdeenshire Council's social work department. Rachel is enormously proud of Dial-a-Community Bus's growth, stating: "When the first five day a week shopping service and community group use buses started working in 2000, I don't think anyone realised the potential, but it has grown exponentially over the years and will probably continue to do so. "The volunteers and staff work extremely hard to ensure that they help as many groups and individuals as possible and I know that the local community are very proud of 'their' buses." Earlier this year DACB were the focus of a Member's Debate in the Scottish Parliament when local MSP Stewart Stevenson raised a motion to congratulate both DACB and the Banffshire Partnership for providing essential transport services in areas with virtually no public transport. "It is probably one of most innovative local schemes of its type and one of the best in Scotland." Banff & Buchan MSP Stewart Stevenson will embark on the next stage of the campaign to secure maternity facilities for Fraserburgh and Banff tomorrow (Tuesday) when he visits the birth unit operated by NHS Highland at Broadford. Last month, maternity campaigners were delivered a huge boost when Health Minister Andy Kerr refused to endirse NHS Grampian’s plans to axe the units at Fraserburgh and Banff and ordered that the Health Board look at providing ‘birth units’ in the towns along the lines of the successful units in place elsewhere in Scotland. Mt Stevenson had written to NHS Grampian in April 2006 urging them to look at the success of the units run by NHS Highland, in particular the one at Broadford which had seen a trebling in the number of expectant mothers giving birth in their local area. “The Minister for Health in his response to NHS Grampian sent a clear message that he wanted to see maternity services in some shape or form continue in Fraserburgh and Banff. “The type of birth units which the Minister referred to have been working very successfully in the NHS Highland area for some years now. I have therefore arranged with NHS Highland to go on a fact-finding mission to visit one of their units and to see for myself what lessons we can learn from them. “This is a very useful example because it tells us two things. Firstly, it confirms that given the choice, expectant mothers will choose to have their babies locally rather than travel. Secondly, it shows that a revamped service on Skye has led to a trebling of births in the unit. Thirdly, and more importantly in terms of the campaign, it shows that a unit can be viable at a fairly low level – at the Broadford unit on Skye, we are talking about 24 births per year. Local SNP MSP Stewart Stevenson has launched the latest edition of his regular newsletter for farmers and those involved in the agriculture sector, ‘Farming Focus’. The newsletter – now into its fourth year – has proved popular with its target readership and regular feedback from readers has allowed Mr Stevenson to raise issues with Ministers at an early stage. “I am delighted at the success of this publication. The idea was originally suggested to me by several farmers who I would meet with annually at the local shows and were keen to receive regular news on the issues affecting their industry at a political level. If you are a farmer or involved in the agriculture industry and would like to receive a copy of Mr Stevenson’s newsletter, please e-mail him at msp@stewartstevenson.net or contact his Constituency Office on 01779 470444.